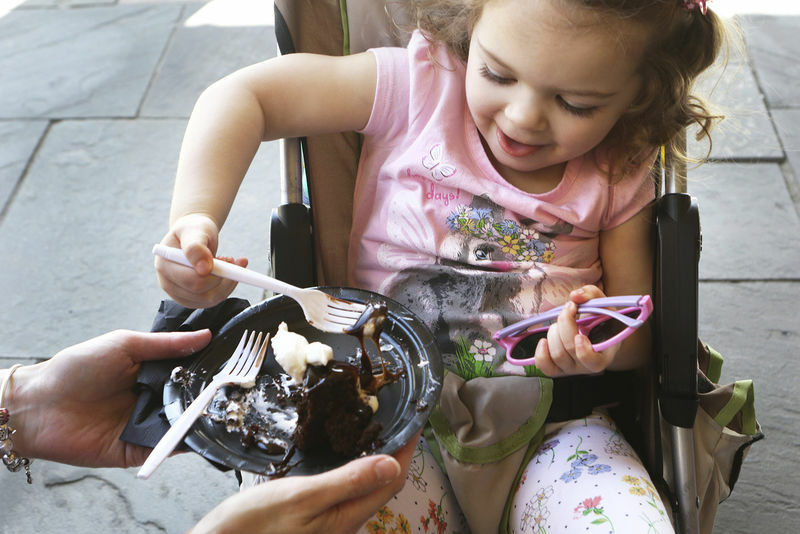 Warm temperatures, sunshine, the strong scent of chocolate and children sporting chocolate smiles surrounded the town of Lewisburg for the 12th annual Chocolate Festival Saturday. Festival chairwoman Erin Hurst was excited to report 7,000 tickets were sold for the event, including pre-sale tickets and tickets bought the day of the event. As of noon Saturday, Hurst said nearly 4,000 festival-goers were already present, and they were expecting to see even more as the day went on. A tasting ticket allowed those who attended to sample a chocolatey treat of their choice from the numerous vendors set up in the downtown streets. Hurst giggled in delight when she said, "I think people just love chocolate, and they really love to come to a festival that's based around such a sweet treat. "Everyone gets so excited for this every year, and we're happy to bring that joy to people." While many sifted through the streets to taste treats of their choice, many were greeted by Mr. Willy Wonka decked out in purple, providing photos with children and information on the hot spots of the festival. 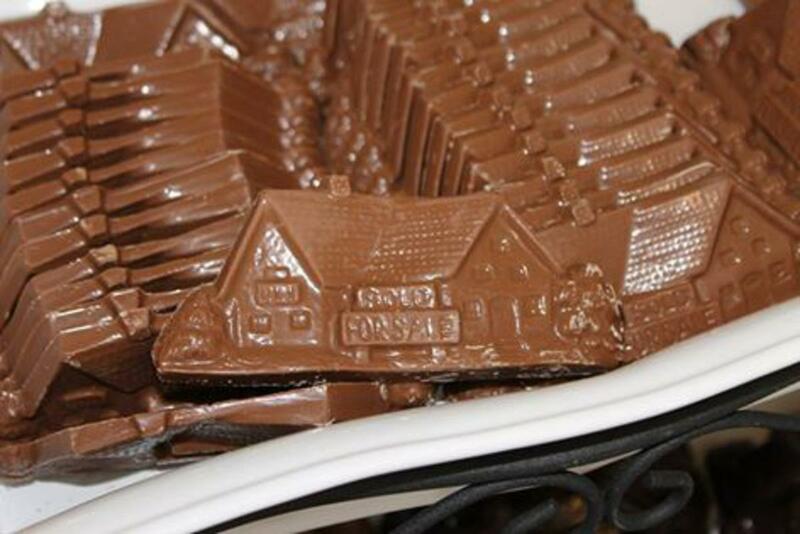 While a wide array of chocolate goodies were offered — including hot fudge sundaes, brownies, double chocolate cookies, chocolate-covered strawberries and white chocolate Oreo balls — a noticeable favorite for many was a dessert offered by Shoney's restaurant with its classic hot fudge cake. Shoney's Human Resource Manager Alexia Burge explained the tasty treat was two pieces of chocolate cake, with vanilla ice cream in the middle and whipped cream on top. "It's always favorite every year since we began coming," Burge said. "They're devouring it. They're eating it and saying 'oh my gosh.'" Although the festival always ends every year at 4 p.m., Burge said their booth tends to run out of their dessert by 2 p.m. As of 12:30 p.m. Saturday, she said they had already distributed 1,000 cakes. "Last year we served and ran out of 1,400 cakes, so this year we made 2,000 and it still seems we may run out early," she said, smiling. Another popular tasty treat was made by Greenbrier East High School's National Honor Society — the chocolate Oreo truffle. GEHS's National Honor Society sponsor Lisa Bibb said the desserts took a great deal of ingredients to make. "We used 45 packages of Oreos, 45 packages of cream cheese, 23 trays of chocolate, and four trays of white chocolate for the drizzle," Bibb explained. "They took us two days to make all of them, and it was definitely a team effort." The National Honor Society has 19 students, who were split into six teams. Bibb said each team had to make 168 Oreo balls apiece, with a little left over. She said in total, the teams ended up making around 1,100 Oreo balls over two days. As of 1 p.m. Saturday, they had 100 left. "People are absolutely loving them," Bibb said, "and it's great to see such a good reaction to something the students worked so hard over." Those who weren't interested in tasting any of the chocolate treats weren't left out of the fun, though. Festival-goers had the opportunity to soak up some sun while listening to live music provided in the Green Space park or check out some of the many shops in Lewisburg. Suzanne Perilli Hancock, owner of SPH Interiors in Lewisburg, said she has been at her Lewisburg location for three years, and every year the Chocolate Festival is such a joy to her and her customers. "And most importantly, it's definitely good for business," Perilli Hancock said. "People come from all over the state, and even out of state, and it's a great way to showcase our town's businesses and restaurants. Everyone always seems very impressed." Perilli Hancock said although the festival had only lasted a couple hours, she had already made several sales. "It's definitely a great day out of the year," she said. "Everyone loves it."